When you add requirements to a module, students must complete the defined requirements within the module before the module will be marked complete. You can require students to complete all requirements in the module, or have them choose one item to fulfill a specific requirement. Note that you cannot add requirements until you have added module items: you can add content items such as assignment types, pages, and files; text headers; external tools; and external URLs. You can choose to allow students to complete requirements in any order, or you can require them to move through the module sequentially. 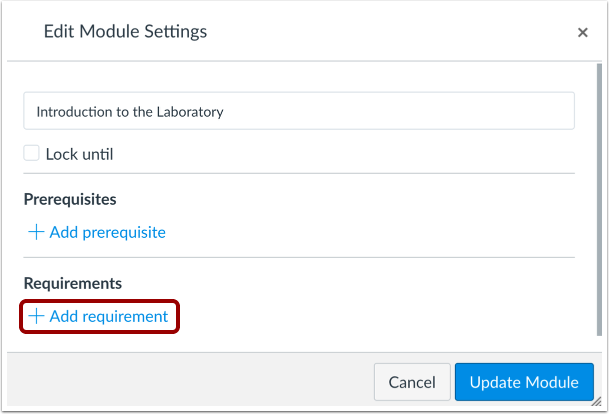 A requirement to move through module items sequentially relates to the order items are listed on the Modules page, not the order displayed in Module Settings. If you have multiple iterations of an module item, you can set different requirements for each item. Module requirements are displayed in the order that they exist as module items. You may need to reorder module items so that the requirements are set correctly. View the item: Students must view the item. Mark as done: Students must mark the assignment or page as done before they can progress to the next item. This option also synchronizes with the student List View Dashboard and completes the item for the student. However, this behavior is only supported when the item with this requirement is located in one module. Adding the same item within multiple modules is not supported. Contribute to the page: Students must post a reply to a non-graded discussion or contribute content to a page (make sure students are allowed to edit pages in the course). Score at least: Students must meet a minimum submission score. With this option, an additional field appears where you can enter the minimum score that students must earn. This option is available for all graded assignment types. 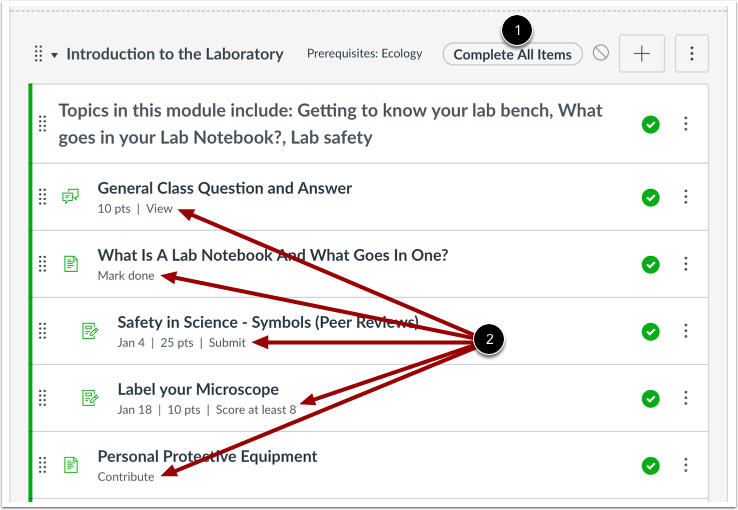 You can also set up prerequisite modules and require students to complete each module in order. Note: If you choose to set the requirement type as completing only one option, and you want to use it with graded items, please note that all assignments with their current grades are reflected in the Gradebook. For instance, if you want a module to require a student to submit one of three assignments, the two assignments that aren’t submitted still factor into the Gradebook as unsubmitted. You may choose to manually configure the unsubmitted assignments appropriately, either by using the differentiated assignments feature or excusing the assignments in the Gradebook. Click the Add Requirement link. When adding requirements, you can choose whether to allow students to complete all requirements, or one of a series of requirements. By default, Modules selects the all requirements option. If you want to require students to complete all requirements in the module, this setting has already been selected for you. As part of completing all requirements, if you want to require students to complete each module item in order, click the Students must move through requirements in sequential order checkbox. If you would rather require students to complete only one requirement, click the Student must complete one of these requirements radio button . By default, Modules populates the first requirement as the first item in the module . 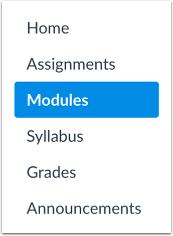 To select a different module item, click the item menu. For the module item, click the requirement menu . To add additional requirements, click the Add Requirement button . To remove a requirement, click the Remove icon . Note: If you have included a content item in the same module multiple times, you can set different requirements for each item. 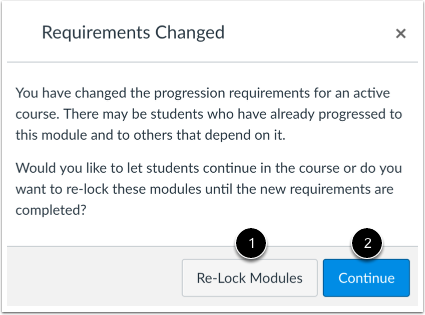 If you change module requirements that students have already fulfilled, Canvas will ask if you want to let students progress through the course or re-lock the modules and require students to complete the requirements again. View the module requirement type  and the item requirements  for the module. Previous Topic:How do I add prerequisites to a module? Next Topic:How do I edit a module? Table of Contents > Modules > How do I add requirements to a module?